Microflow CVO, a new company spun off from research in the Oregon State University Microproducts Breakthrough Institute (MBI), has launched its first product line of stainless steel micromixers. Inside the precision-engineered devices are a multilayer network of channels designed to meet manufacturer needs in the pharmaceuticals, petrochemicals, personal care products and other industries. Microflow CVO (www.microflowcvo.com), a new company spun off from research in the Oregon State University Microproducts Breakthrough Institute (MBI), has launched its first product line of stainless steel micromixers. Inside the precision-engineered devices are a multilayer network of channels designed to meet manufacturer needs in the pharmaceuticals, petrochemicals, personal care products and other industries. Dime-sized mixers perform a critical step in high-value chemical operations including nanoparticle synthesis, precision blending and laboratory automation, but they can also add value to the broader chemical industry. Microflow CVO’s microfluidics architecture leverages integrated-circuit design concepts to create devices that can be scaled and designed to manufacturer specifications, said Todd Miller, prototyping manager at the MBI and president of the new firm. Miller said the company has licensed rights to patent applications he has made over the past five years while at OSU. A market analysis by the OSU College of Business estimates the global micromixer (also called “microreactors”) market in the life sciences at $2 billion. “It’s a rapidly changing and growing market,” said John Turner, OSU instructor and CEO of Microflow CVO. He and OSU MBA student Ken True identified more than 1,000 researchers at 270 institutions in 30 countries using microreactors in pharmaceutical research. “We expect the market to exceed $3 billion by 2014. And that’s only in the life sciences. Other chemical manufacturing markets raise the potential for these products,” added Turner. The problem that Microflow CVO has addressed seems simple: how to efficiently mix two liquids with consistently high-quality results. Manufacturers commonly perform this step in large vats where batches of liquids are stirred and then processed. In contrast, microfluidic technologies push liquids through channels slightly larger than a human hair where mixing occurs under precisely controlled conditions. While the results can meet manufacturer specifications, existing micromixer designs tend to be fragile, expensive and hard to adapt to specific circumstances. The company currently offers two products for sale and will expand its offerings to more than 15 by the end of the calendar year. The additional offerings will provide options in flow rates, fluid inputs and operational scale. 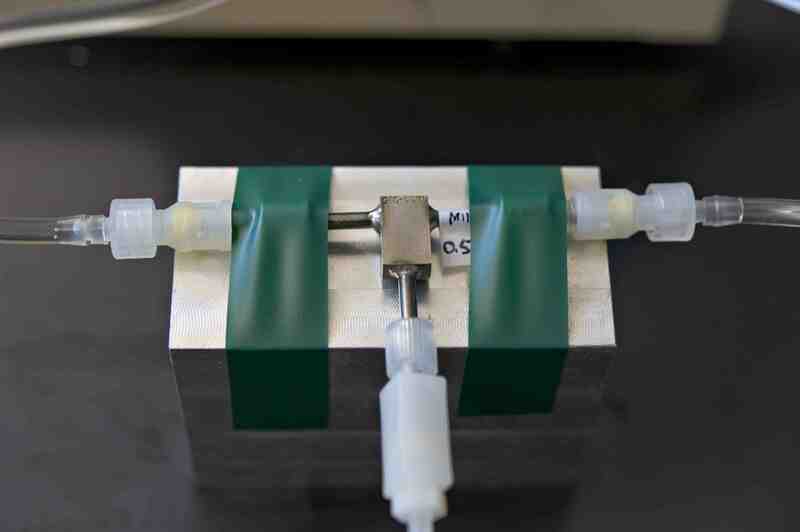 Microflow CVO began with a chance encounter at a Portland, Ore., meeting hosted by the Oregon Nanoscience and Microtechnologies Institute (ONAMI). 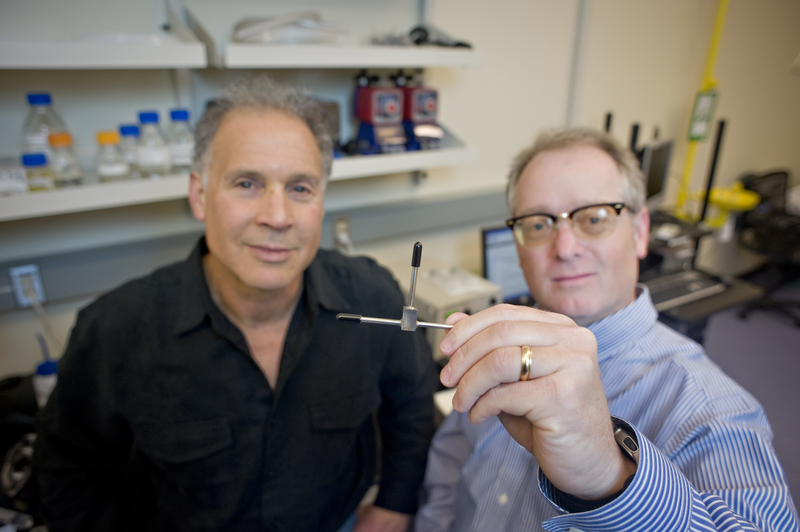 Miller met Scott Gilbert, an expert in microfluidics then affiliated with the University of Washington. Gilbert was looking for a microfluidics device that could provide precision blending of modestly viscous fluids (such as anti-freeze) at a high flow rate but a low pressure drop. His target was the petrochemicals industry. Years before, Miller had made prototypes of such devices, but further development was slowed as other duties and projects required his attention. Gilbert’s question sent him back to the drawing board — in this case, computer modeling software — where he worked out the details. The prototype Miller built at the MBI exceeded mixture specifications without additional processing. Gilbert now serves as chemical safety officer and research associate at the MBI and is chief technology officer of Microflow CVO. Ormond “Norm” Galvin is vice president of sales for the company. Based in Corvallis, Oregon, Microflow CVO designs innovative high-performance micromixers and microfluidic components that improve industrial processes, reduce waste and lower capital costs. The company maintains close ties to the Oregon State University Microproducts Breakthrough Institute and the Oregon Nanoscience and Microtechnologies Institute.